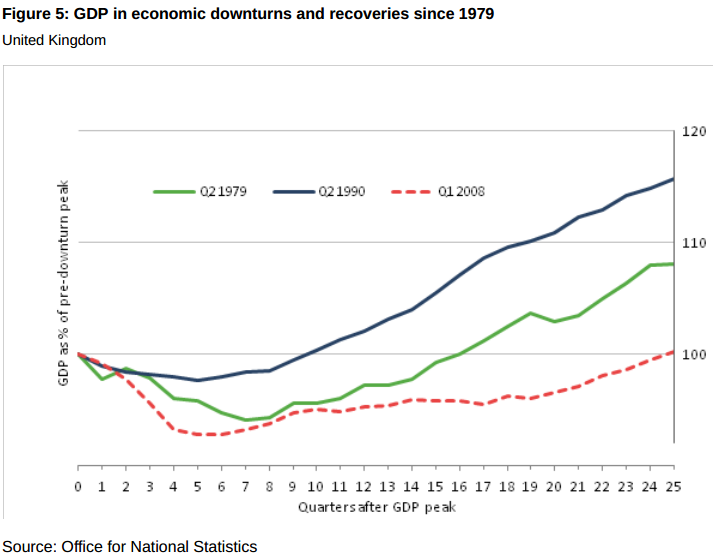 It seems the UK is something of a poster child for economic recovery. 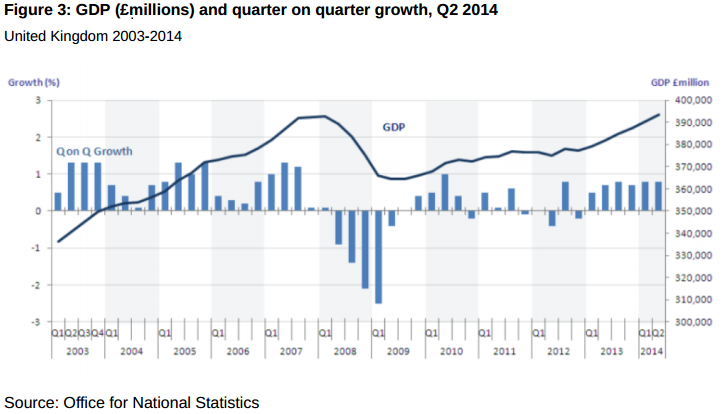 The ONS reports that GDP has grown by 0.8% in Q2 and by 3.1% since Q2 2013. This is a pretty solid performance. And it's an important milestone, too: the UK's GDP is now back to its pre-crisis peak. And the UK has become one of the few bright spots in the IMF's generally gloomy forecast for world growth. Upgrading the UK's growth forecast to 3.2% by the end of the year, the IMF said that the UK would maintain its position as one of the world's fastest-growing economies. And Matthew Holehouse, political correspondent of The Telegraph, describes the IMF's upgrade as "a vindication of George Osborne's economic plan". 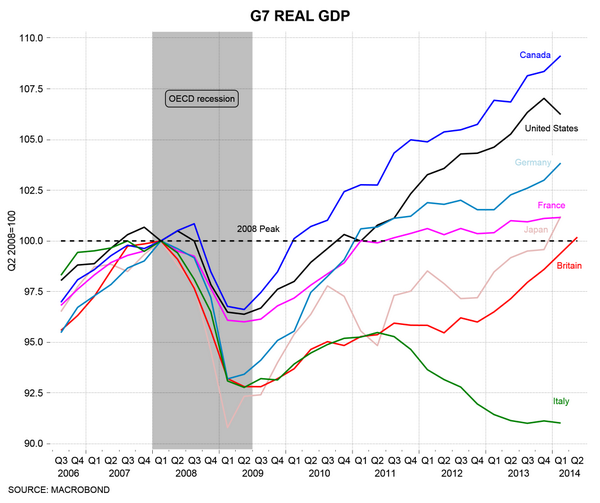 How on earth is the second slowest recovery in the G7 "vindication" of George Osborne's policies? And it's not just because the UK had a very deep recession, either. Japan - yes, you know, that country we like to think is in an eternal slump - had a deeper contraction but has recovered faster despite the tsunami and Fukushima disaster. 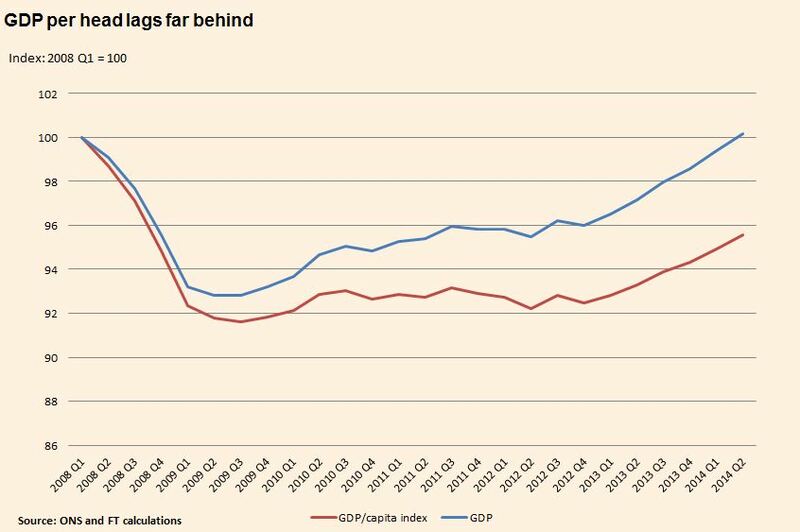 And Germany, whose contraction was nearly as deep as the UK's, exceeded its 2008 GDP peak in Q1 2011. Best keep the lid on the bubbly for a bit longer. So the phrase 'Long Term Economic Plan' really boils down to 'Long Term'?